Anti-stress therapy for your workplace or office. Top companies take welfare at work seriously. Caring employers find it easier to recruit and retain good staff. Your profits will be healthier too! On-site complementary therapies are clean, cost effective, cause virtually no disruption to the workplace and are carried out by a fully qualified and insured therapist with over 30 years experience. Therapies are given in strictest confidence and comply to the Data Protection Act. 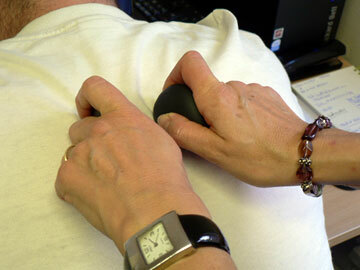 Neck & Shoulder Massage (20 min) will ease stress and tensions, concentrating on key areas where tightness accumulate. 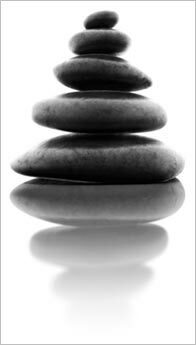 A massage that will both relax and exhilarate. Indian Head Massage (20 min) particularly beneficial for migraine, sinus problems, poor sleep and eye strain. This massage follows the body’s natural energy lines, it includes neck, back and scalp. Stone Therapy Massage (20 min) gives 4 times deeper pressure than manual massage using both warm and hot stones for the back/shoulder and scalp area. The heat assists in dispersing stress from congested muscles. Hydrotherm (20 min) - a unique massage system which combines the use of warmth and water due to the warm water-filled mattress. The weight of the person acts to increase the pressure gained from the massage. No clothing has to be removed nor any oils or cream used. All record card information is taken in strictest confidence and complies to the Data Protection Act. The aim of Stressuless Corporate Complementary Therapy is to provide employees across the spectrum with the opportunity to access certain treatments during their working day and so taking away one of the most common barriers of receiving such treatments - finding the extra essential time. Stressuless has many years of experience in this profession to draw from, working with numerous clients from all professions. These clients have generically stated that part of the reason they feel the need to use a massage therapist relates to the constant need to juggle their ever increasing work loads with their life at home and socially. For some it was down to the actual activity of being at work i.e. sitting in front of a PC for long hours or dealing with stressful situations. This generally results in high levels of stress being produced. Therefore, as similar patterns emerged when treating clients with therapeutic massage, Stressuless realised and understood what was actually needed – namely, to supply a small range of similar treatments in their work place to help begin to eradicate their problem at the source of the cause. The benefits and advantages to the client were very clear.